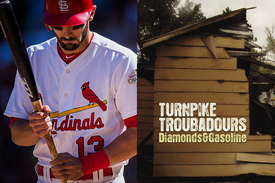 Signs that good, independent country music is beginning to poke through to the public consciousness are all over the place, and during tonight’s MLB All-Star Game, we got yet another big one when St. Louis Cardinals All-Star second baseman Matt Carpenter chose the Turnpike Troubadours‘ song “Long Hot Summer Day” from their album Diamonds & Gasoline for the walk-up music during his plate appearance. Originally written and performed by bluegrass great John Hartford, Carpenter started using the Troubadours version in 2012, but this is the first time it has had a chance to be showcased on such a grand stage. And apparently the fandom is mutual, with the Troubadours throwing their support behind Carpenter. It probably helps that Carpenter happens to play for the team closest to the Troubadour’s native Oklahoma, and that Matt grew up in Sugar Land, TX and went to school at TCU in Ft. Worth—a Turnpike Troubadour stronghold if there ever was one. 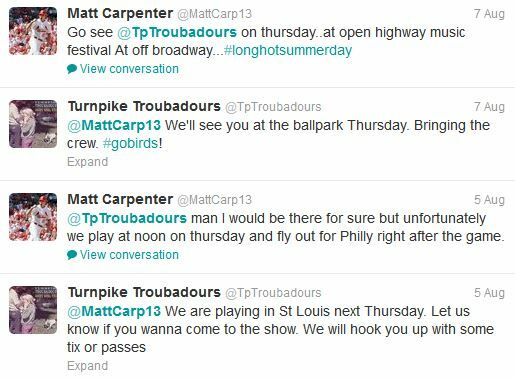 Matt Carpeneter and The Troubadours have communicated their mutual respect back and forth on Twitter over the last year or so since Carpenter began using the song. The Turnpike Troubadours have seen a steady rising action over the past few years from their heartfelt songwriting and infectious tunes. They are quickly becoming one of the biggest names in Texas/Red Dirt music and threatening to break out nationwide. Their last album Goodbye Normal Street made many people’s lists as one of the best of 2012 in country music. That’s so awesome. They are probably my favorite band, and I think if any sport would promote outlaw/red dirt country, it would be baseball. Matt Carpenter was born in Sugar Land, Texas, and went to college at Texas Christian University. Makes sense he’d have such fine taste in music. I am a die hard Cardinal fan and attend several games a year. It puts a smile on my face every time Matt comes to the plate. On a side note, there are several Cardinal players that use country songs as their walk up tune. The John Hartford song reminded me of the Hooten Hallers. My 15 yr old niece on her own dropped One Direction and started listening to Mumford and the Lumineers and was excited about them. I made her a mix of some SCM favorites and Turnpike Troubadour was her 2nd favorite (after Kacey Musgroves…alas Sturgill and Lindi are a bit much for her right now). So now a bunch of northern NJ teens are heading to the pool listening to the Troubadours rather than FGL. Just have to get the word out one listener at a time. First All Star game I’ve missed in years………damn it!!! Well,you didn’t miss to much. Very coool. Yes Fort Worth is a stronghold for the turnpike boys they come within a few hundred tix of selling Billy Bobs every time. Which is big a sell out is six thousand. Just listened to goodbye normal street a few days ago. Damn fine record. These guys just might break thru yet fingers crossed. As a fellow Horned Frog, it’s nice to see TCU and good country music represented on a big display. The troubadours are gaining some massive steam and although probably won’t hit the mainstream, they will become a staple of Texas/Red Dirt/Americana scene, much like Bowen, Boland, Rogers and many more. I think after the Damn Quails release their next album, they will be up there with the troubadours. As a huge Cardinal fan, it’s been really fun to watch Matt Carpenter blossom into a full-time player this season. I dug his at-bat music when I’d seen him at the plate earlier in the year, but I was unfamiliar with the song as I still have not listened to much Turnpike Troubadours. His walk-up song once again piqued my interest when I saw his at-bat on the All-Star game last night. Thanks Trig for identifying this one. I’m gonna have to give TT’s stuff a closer listen. Go Cards. As a die hard Cards fan myself it caught me off-guard when I started hearing Matt walk up to Long Hot Summer Day. Two of my favorite things coming together! Maybe I can meet Matt at a Troubadours concert one day. Diehard Cards fan here. Loved what I heard when I first heard Carpenter’s walk up music. It turned me on to the Turnpike Troubadours, and I bought their album Diamonds & Gasoline because of it. Great music, and great job spreading the word, Matt. Cardinal Nation!!! I’m a StL resident, Cards fan, and big TT fan. I cross the Mississippi and see those barges every single day. Nice to see some love for my town and music on a blog I read every day. Plus … Off-Broadway in STL is an awesome venue for music. Love Off Broadway. Saw Micky and the Motorcars and Mike McClure there. Very nice catch on your part, Trig. I completely missed the fact that each starting player had his own intro music. I was born in St. Louis, left in 1964 to move to Tennessee, and returned there in the early 1980s to practice for awhile. I have been a Cardinals fan since I was a young child, and I spent quite a lot of time in the old Busch Stadium for many years. I am also crazy about the Turnpike Troubadors. My Dad is from the Bronx. I was born there, but grew up in NYC northern suburbs. I grew up a passionate Yankee fan. I was probably most passionate and loyal during what was called the “Horace Clarke Years” (like the second baseman, the Yankees were an OK, middle of the pack team) during the late ’60s and early ’70s. Back then, the best team in town were the Mets. I was an American league fan at all-star and World Series time, although I did make an exception for the 69 and 73 Mets. I do remember being heartbroken when Pete Rose bowled over Ray Fosse at a play at the plate to win the all star game for the Senior Circuit in extra innings in 1970. My first sports hero was Mickey Mantle and I saw him hit at least a few of his 18 homers in his last year of 1968 at the old (and not yet renovated) Yankee Stadium. That was really my first year as a baseball fan and the Mick was a shadow of his former self, but I read everything I could about his glory days. Mickey was from Commerce Oklahoma, which appears to in the northeast corner of the Turnpike Troubadours’s home state. And he grew up a Cards fan. Great band, the Turnpike Troubadours. Cool that they got this exposure.